Cp is a process index that describes variation relative to the tolerances or specifications. Cp is a short term process index that numerically describes the "within subgroup" or "potential" capability (Pp is long term indicator) of a process assuming it was analyzed and stays in control. Physically speaking the width of the distribution regardless of centering around the process mean or a provided target value. The tighter (thinner) the distribution the higher the Cp. It is an option (along with z-score and PPM) when describing the process baseline measurement in the MEASURE phase or in the CONTROL phase when obtaining the final performance analysis. The Cp has no value for unilateral tolerances. Unilateral means that only the LSL or USL is provided, the calculation of Cp requires both specifications. Cp is always greater than or equal to the value of Cpk. A perfectly centered process with the mean on the midpoint of the tolerances will have Cp = Cpk. Cp should always be analyzed with Cpk, as Pp should always be analyzed with Ppk. 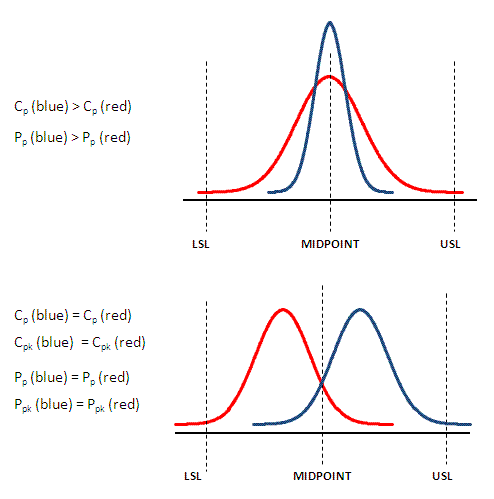 Similar to Pp, the Cp capability index is a function of the standard deviation, not a nominal (target) value that may be historical or provided by the customer. 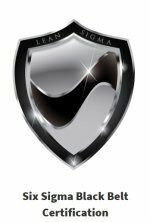 It also requires input from the customer for the lower specification limit (LSL) and upper specification limit (LSL). As with all the process capability indices, ideally the process should be in control before assessing capability. Use time-series and SPC charts to determine process control. If the process is out of control (i.e. still rising with upward trend), then assessing current process performance is not likely to reflect the long term performance. An out of control process could produce and capability value at any time, it's like a shot in the dark. Once the Cp is calculated a determination of acceptability is done. Customers vary in their minimum requirement (acceptability limit) for the values of capability indices. As the pursuit for perfection increases these minimum acceptability levels will increase which means that process must perform with less and less variation. where R-bar is the average of the ranges from each subgroup estimated from the X-bar & R control chart. The value for "d" is found from a table based on the subgroup size. There are other estimates for this sigma value, the above estimation is commonly used. >1.33 or >1.67 are typical acceptability levels for Cp. A high value for Cp and low value for Cpk means the process is precise (narrow distribution) but work needs to be done to get the mean centered around the midpoint of the specification limits. The required values may be available in the form of published standards or it may need to be requested specifically. The amount of samples required and subgroup sizes (if applicable) for capability analysis and control charts can also vary by customer and needs to be determined before starting these calculations. 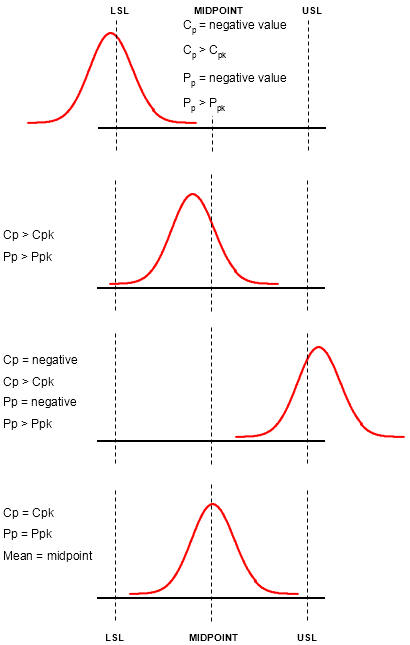 Cp is a measure of variation only. Cpk is a measure of location and variation. Cp will never be a negative number. Cpk can be a negative number.